Another relatively quiet week….not sure what is up with me….quite happy to stay at home at the moment! 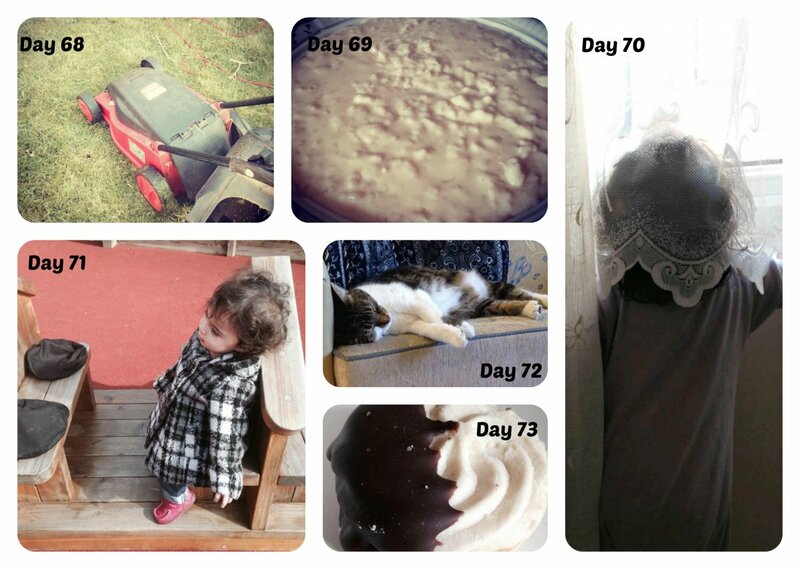 Day 68 – Sun was shining, and the grass was annoying me so did the first lawn mowing of the season. Then the hairdresser came round and cut my hair and added purple highlights to it! Decided to go a bit crazy! Would have shown you all but because I now cover my hair I can’t! Day 69 – I purchased a slow cooker last week and made rice pudding in it…..it’s the only thing I have made in it so far! Day 70 – Bee has taken to standing at the window shouting ‘bye’ to any cars that pass. As it is a relatively quiet road she does end up waiting a while. Day 71 – (wrong numbered pic up there) Forgot to take a pic to be honest and only remember when everyone was asleep so one of Rosie. It was the end of the day and I was ready to put my feet up. Made a hot chocolate, came into the room to find she had taken my spot on the sofa. Didn’t have the heart to shove her off! Day 72 – (wrong pic) Toddler group today. It is the first time we went out in the garden area and Bee loved it. Day 73 – Couldn’t resist! Day 74 – Out in the garden today and let the rabbit have a run around although had to keep an eye on the cat at all times! Ooh so can you see the purple or is it like a lowlight that shows up in the sun? Your rabbit looks huge! You can see it. Although in some light it looks more red than purple! Your rabbit is so cute masha allah! Oh defo have a go. So easy and turned out tasty! 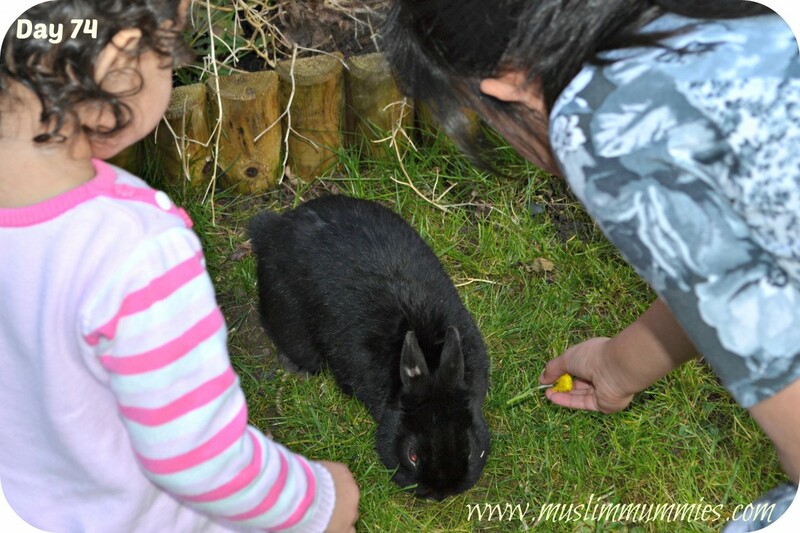 Loved Bee and Munchkin feeding the rabbit. your hair colour sounds lovely – very bold and funky of you! that is one biiig rabbit but what a lovely shiny coat it has. Looks like you also have many things to do at home Foz. Love your Rabbit, so cute!! need a few more rabbits and they will cut the grass for you. May I ask (sorry dont mean to sound cheeky I am just curious) why have your hair coloured if it has to stay covered all the time? Had to laugh at her shouting at the cars, my daughters favourite was always the bin men and she would go out on the balcony and watch them and they always gave her a wave, it made her week!! Lol my hubby said the same thing.